The Tankerville site was a real hive of activity today; it was good to feel the place coming alive again after sitting empty & inactive for so long during the long wait for planning permission to come through. There were men & machines hard at work every where you looked. 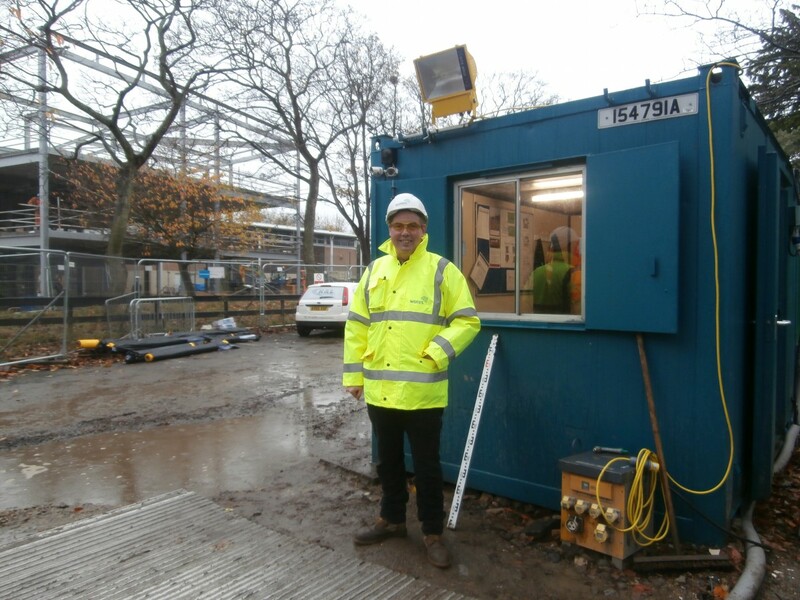 The first workman any visitor to the site must meet is the Gateman. All visitors must first get past the Gateman, Peter Wilson. My visits to Tankerville each Wednesday seemed to be coinciding with dull, drizzly weather at the moment, which isn’t ideal when trying to photograph a grey steel structure. It also makes it nigh on impossible to convey the tangible buzz of excitement on-site now. The new build had obviously come on apace since last week and it was now possible to get a clearer sense of the size it was going to be. For anyone with a memory of the low-level Church High Junior School, this was starting to feel very strange. It is going to be big! 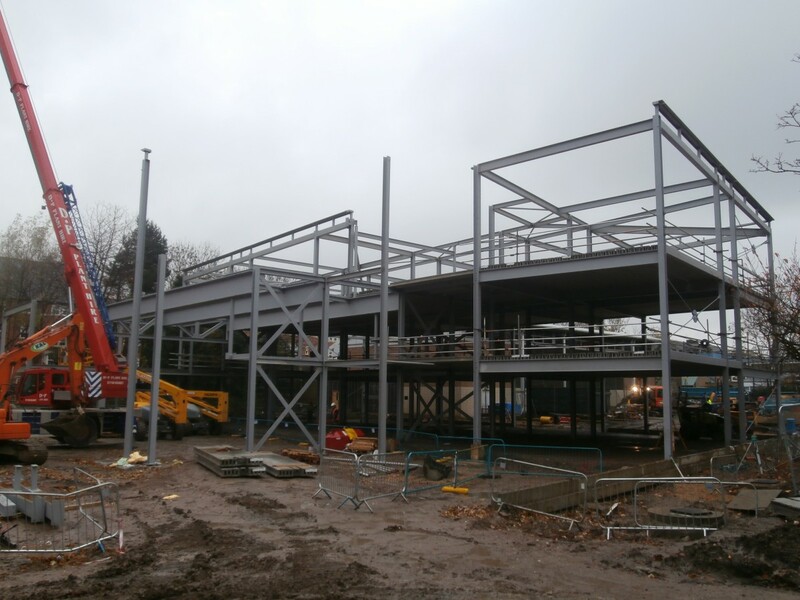 The new build’s steel structure grows apace in the greyness. 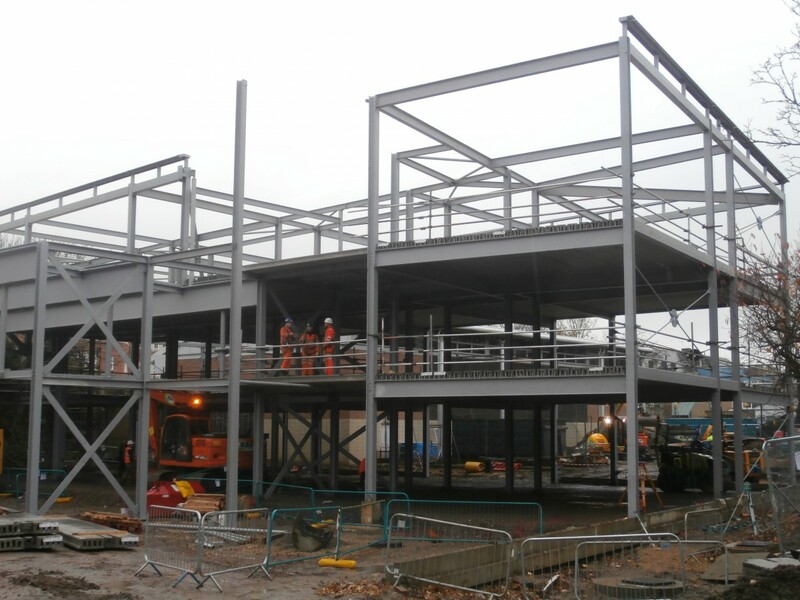 The steel structure was now developing a sense of depth as well as height. 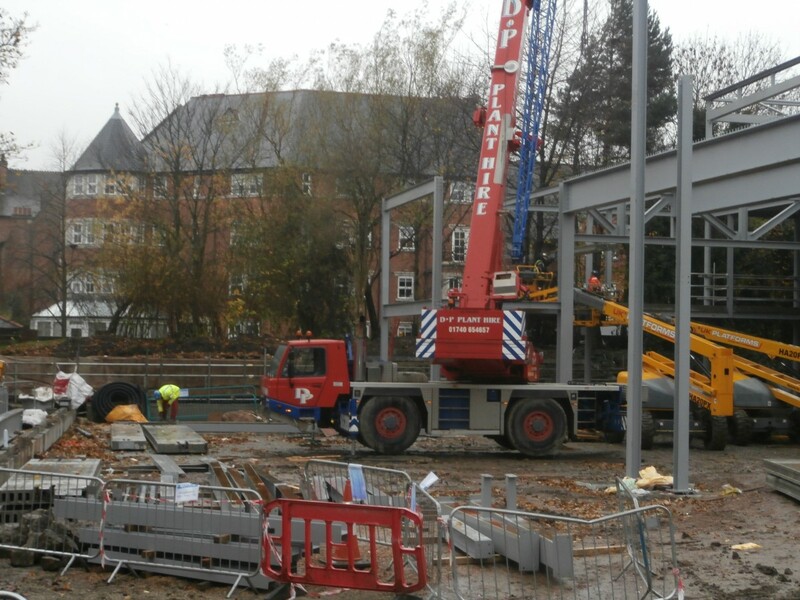 Not only were all three storeys of the first section now in place, it was starting to feel three-dimensional. Safety rails had now been put in situ for the workers, but the most obvious new development this week was the presence of flooring. Men had clearly been very hard at work recently and, as if on cue, three workmen moved to the edge of the first floor and stopped to talk then wave. The presence of human bodies within the steelwork not only had the effect of bringing it to life for me for the very first time, it also helped convey the sheer scale of the developing structure. Three workers kindly appear to bring the building to scale. In front of Princess Mary Court, it was possible to see to my left the building’s ground floor plan starting to evolve much more clearly. The new build ground floor plan is becoming a lot clearer. 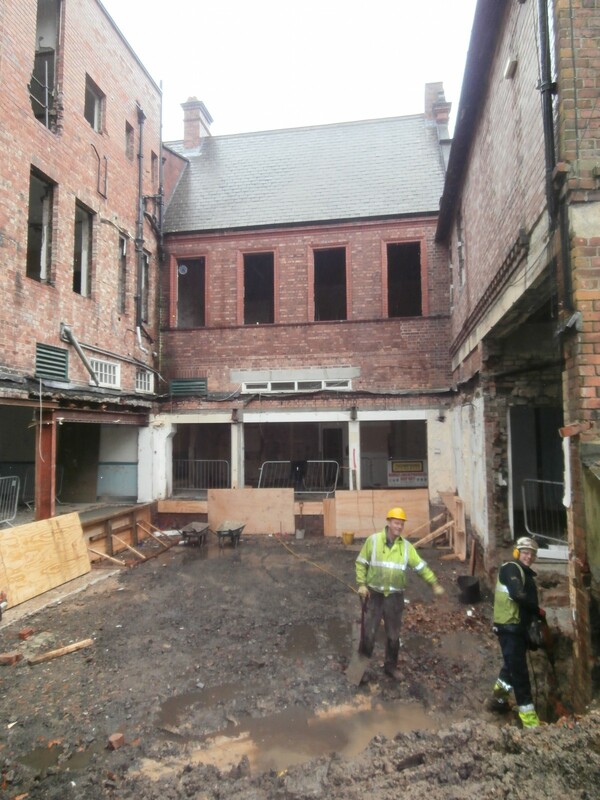 Today, however, the most interesting thing for me was the renewed activity on the old Church High building. As I photographed the steelwork, a yellow dumper truck was moving back and forth behind me all the time, its scoop full of a gravel-like material, and, to my left, over beside the newest part of the old building – the Home Economics & Art Block – a JCB digging machine was also at work. The site is looking like Diggerland today. The next Dumper truck load heading for the old building. 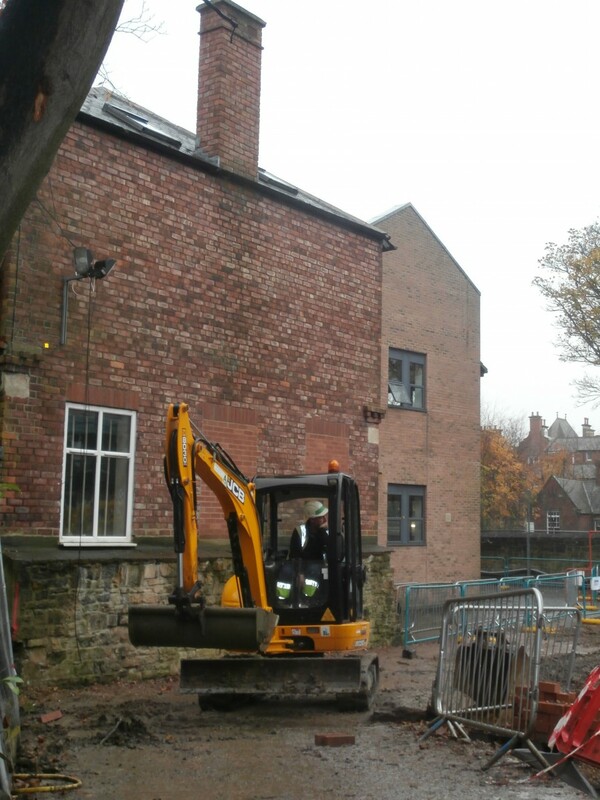 The yellow digger was bound for the gaping gap where the single-storey kitchen had once stood. 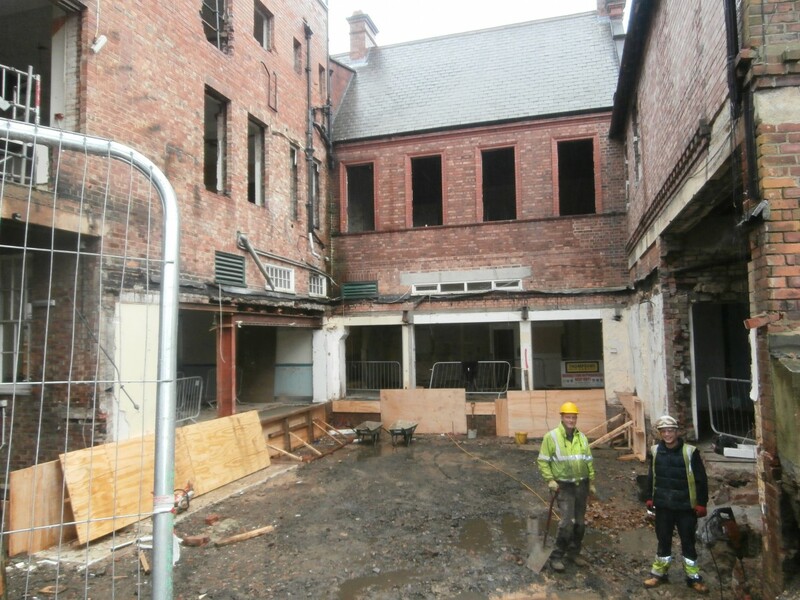 Work on the foundations for the new glass-fronted circulation extension was now well underway. Site Supervisor, Eddie, and friend working on the foundations of the new extension block. My weekly visits are by now becoming normal for the work force and today everyone seems in a particularly good mood. There was no shortage of workmen happy to stand and pose for the camera. Whilst always curious about what new things are happening, a big part of my mind is always aware that I am possibly seeing parts of this much-loved building for the very last time. In front of me now are windows which soon will be letting in light for the very last time. The men at work are happy to pose for the camera today. As I made my way off-site, the heavens finally open. Luckily I had come prepared with an umbrella today. 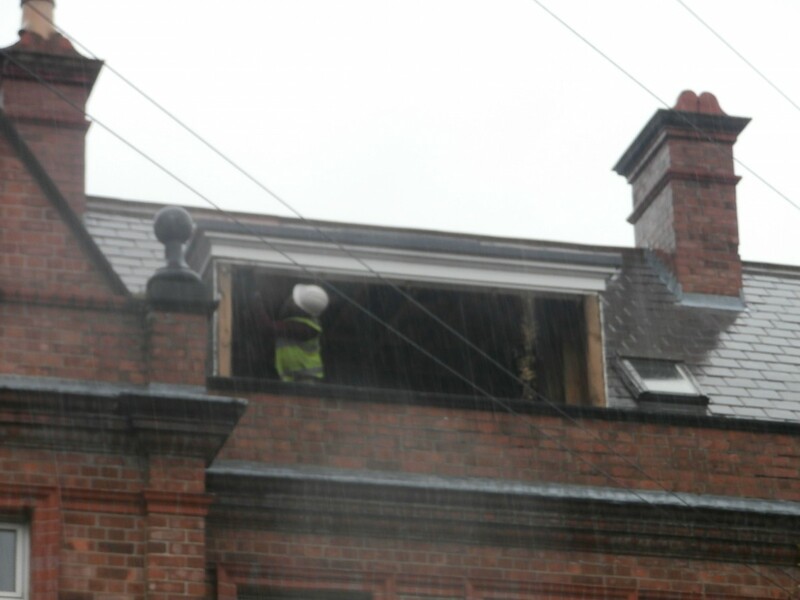 I note that work is still going on in Alison Roe’s Deputy Head’s room above me. 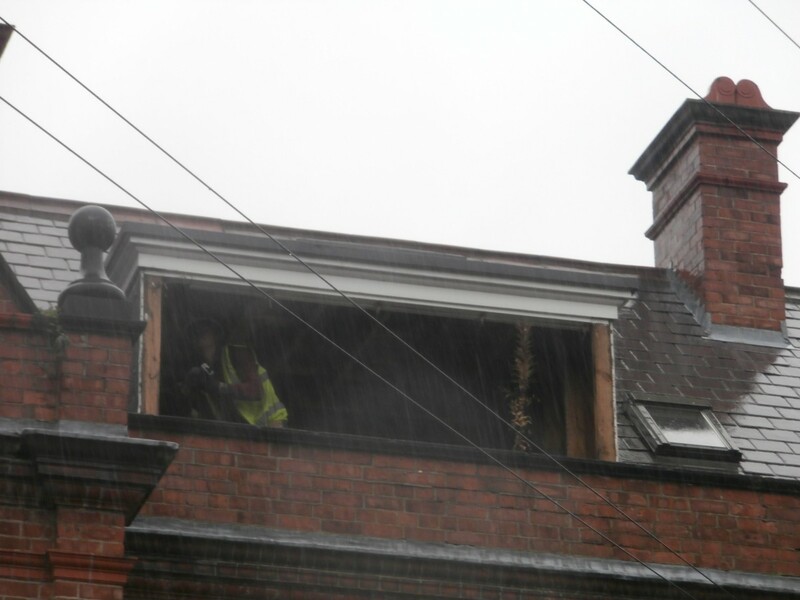 With no window, not only must it be draughty, but very wet indeed up there now! Exposed to the elements: the work still goes on inside …..
……. and outside of Alison Roe’s Office high up in the eaves. As I pass Westward House, a group of men appear, all well wrapped up against the rain in bright, water-proof, high visibility jackets. I realise one of them is Project Manager, Nick White, and stop to talk. 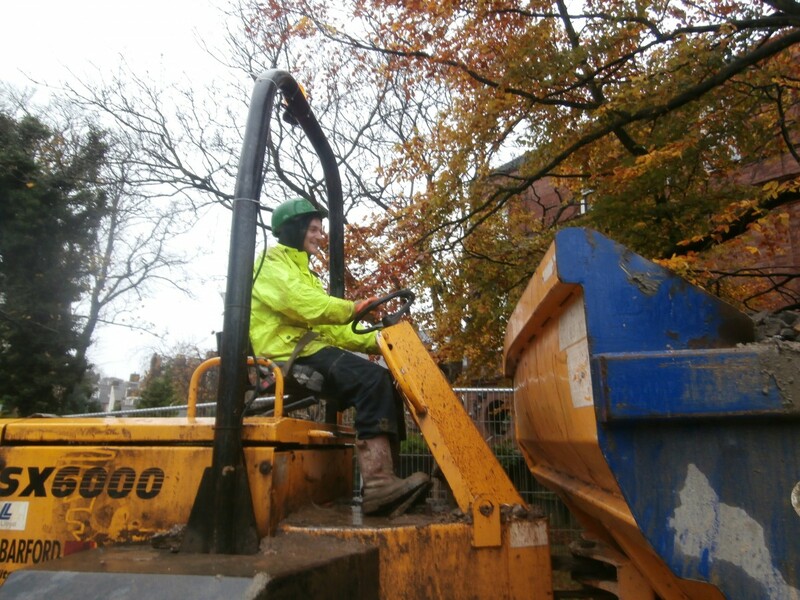 It wasn’t just the men on-site who were happy to smile for the camera today, despite the rain. The work must clearly be going well. 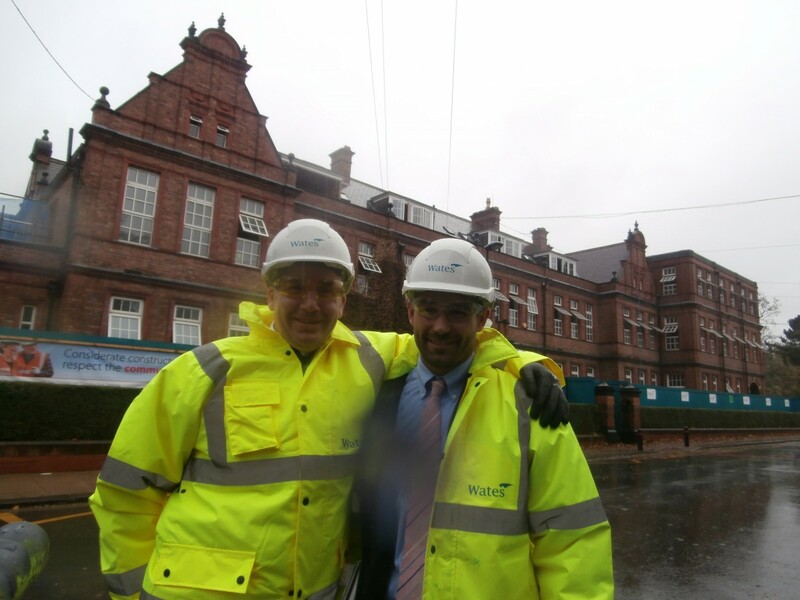 The work on the building is clearly going well: Construction Director, Neil Matthias and Project Manager, Nick White are happy to pose in front of the building despite the rain. I remember that feeling of watching a building or place we loved about to be changed forever. My friend Liz cycled around the old senior school playground before the ‘new’ science block was built in about 1982! In the summer holidays we came up to school with our bikes and had a good cycle around, knowing that we would be the last ones to do so. Happy days. What year did you leave Church High, Helen? We could have overlapped or just missed each other. I joined the teaching staff in Centenary year – September 1984.